This is a fairly straight-forward Chianti Classico at a reasonable price of $15 or so. It has a profile of red fruit with some savory notes that create depth and richness. 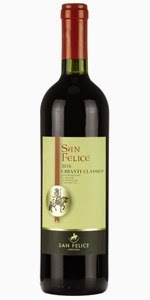 In fact, as a young non-reserve wine it's better than the San Felice Chianti Classico Riserva 2008 which I recently had. Enjoy with hearty Italian fare, and raise a glass!